Transumanza is the Italian term for the ancient tradition of transhumance, which describes the seasonal movement of livestock between summer and winter pastures. This nomadic practice has been carried out in Tuscany, Italy since time immemorial and is a sight to behold, as large numbers of goats, sheep and cows are herded along age-old routes, across the rolling hills and through the woods of this beautiful countryside. Tuscan landscape photographer Gianluca Federighi accompanied a local shepherd as he relocated his dairy livestock from the summer grazing in the valley to winter pastures at higher altitude. He documented the journey with his Leica M10, capturing not just the sheer commotion and chaos of such a large herd of mixed livestock in transit, but also the ancient bond between man, animal and Tuscan soil. We spoke with Gianluca about his experiences shooting the Transumanza and which technical considerations he made to produce such a strong storytelling aesthetic. Since I was a child I have had great interest in photography and I always considered it to be a very strong means of communication and expression but my passion for photography was born on a trip to America. It was an inspiration to me, being in the land of the Native Americans: red earth, blue skies, white clouds and far-reaching, wide open, wild spaces where you can get lost and find yourself. Everything regarding my passion for photography was born in those lands, when I returned to Italy, I’d taken a lot of photos! Was there a particular photographer, who also inspired you along the way? Yes, there are many photographers who have inspired me, for example, Sebastião Salgado and Ansel Adams. I agree with Adams that each photograph you take is a manifestation of all the pictures you have ever seen, all the books you have read, all the music you have heard and all the people you have loved. Nevertheless, I think the one photographer that has had the most influence on me was Josef Hoflehner. I love his Zen vision. For me his photography is really mystic. The majority of your work could be categorized as long-exposure landscape photography. What is it about this genre of photography that interests you? I love this kind of photography because I love nature and the element of water really fascinates me. In the reflections of the water I see all the colors of the world. I like to immerse myself in nature and take my time, for this reason I love long exposures. I use a lot of neutral density filters to slow down the passage of time and to create a muffled effect on the landscape. For your series Transumanza you accompanied a local Tuscan shepherd as he moved his livestock in search of new pastures. How did you come to shoot this story? Can you tell us more about this fascinating journey? I was really lucky to have the possibility to shoot this story. 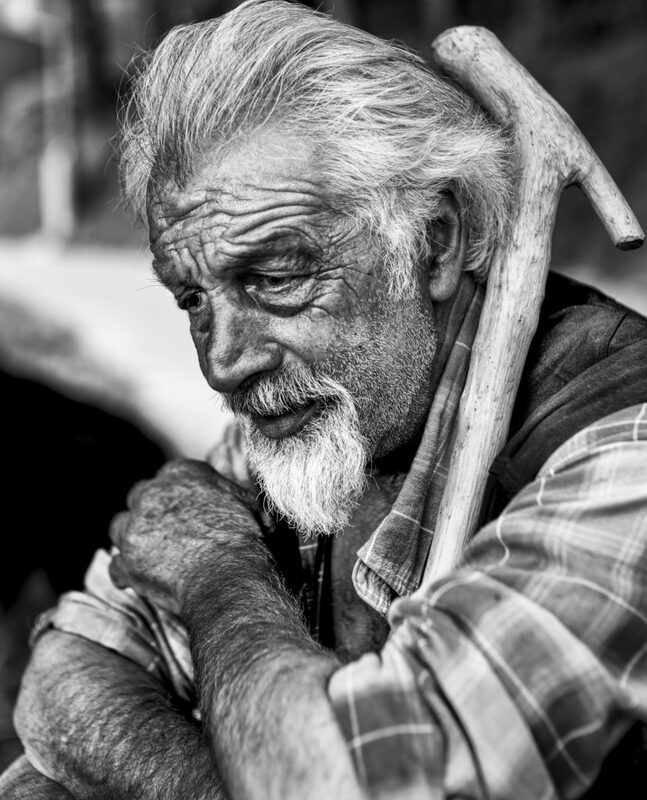 For me it was an inspiration to work with Marcello the shepherd, whom I happened to meet on an otherwise ordinary day in the Tuscan countryside. I was immediately fascinated by his personality and the story behind his work as a shepherd resonated with me emotionally. For these reasons, I decided to accompany him and his dear animals on the long and tiring journey of transhumance. This journey is an ancient tradition, which provides the animals with a high-altitude, mountain pasture. The shepherd and the livestock weave their way among the hills during two days of continuous travel. During the ascent, you immerse yourself in the scent of nature and having experienced the journey first-hand, I can say that it is a laborious task. The life of a shepherd is a life full of sacrifices and it is true that only those who truly love this craft can make this their life’s work. How did your process for shooting this series differ from shooting landscapes? What challenges did you have to overcome? It was very different for me to do shoot this type of story because the sheep, the goats, the cows and the shepherd dogs, as well as Marcello himself, were constantly on the move. The light conditions changed often from one second to the next and then there were the dusty roads, the insects attracted by the smell of cattle and from the sweat on the skin, the heat of the day and the cold of the night. This all combined to make the challenging task of photographing the journey more difficult, but at the same time all the more enthralling. You have also included a number of portraits of Marcello, the shepherd, which give the impression of a rare and fascinating character. How did your relationship to Marcello develop? And how would you describe him? Marcello is truly a rare person. I’m really very lucky to have met him. His way of life is what I believe are my origins as a true Tuscan and I think we developed a strong relationship during the time I accompanied him! Marcello is very friendly and he has no filters. He’s a pure and genuine person. The motion blur effect present in a lot of these images creates a real sense of this movement. How did you go about creating this effect? Yes, this project could be called “Transhumance at 1/12” because that was the shutter speed I used the most. It provided the images with a consistent motion blur effect and communicated visually the movement of the cattle. And how did you adapt your exposure times depending on the varying light conditions? Working with a Leica camera is really simple, you don’t have to worry about millions of features and settings, so you can concentrate only on what you really need. Combining this with outstanding ISO capabilities you can leave this value set on automatic and then simply choose the most suitable shutter speed. Why did you choose to shoot this series in black and white? I chose to shoot this series in black and white because I was concerned that by shooting in color, the viewer could be distracted from the sheer sense of movement and the true meaning of transhumance. Which camera and lens/lenses did you use for shooting the series? And what do you consider are the advantages of shooting with this particular set-up? I used the Leica Monochrom and the Leica M10 with a Summilux 28/1,4 and Noctilux 50/0,95 just because I had imagined the light conditions could be critical and particularly challenging at lowlight. This particular set-up provided incredible performance, even at very high ISO, and always left me feeling I was in control of the situation. When did you first discover Leica cameras? And how would you rank the M10 within the Leica range? I saw my first Leica in a shop window about 8 years ago and since that time I haven’t stopped using a Leica. The thing I love most about Leica cameras are their personality. Like all Leica cameras, the Leica M10 has its distinctive character, but what makes it unique for me are its high ISO capabilities and the unique feeling of holding it in my hands! How much editing work did you put into creating your final images? And do you have a particular editing process that you apply to all your images? I spend quite a lot of time editing my final images because I like to bring out the infinite details that Leica cameras and lenses manage to capture. I often convert images from color to black and white with Silver Efex Pro. What are you working on at the moment? And what can we look forward to seeing from you in the future? I’m currently working on a lot of projects and some even just for myself! The longest of these is a two-year-long project on the Via Lauretana, an ancient route of Pilgrimage across Italy, focusing on the Tuscan stretch of route and the history of the cloistered nuns and Passionists devoted to Santa Gemma Galgani. In the future I will also certainly work on a project on Native Americans, their land and their culture. See more of Gianluca’s photography at his website and connect with him via Instagram. a true and exciting story congratulations!!! Like the ambiance, the ligth… congrats. Gianluca, thanks for sharing your work. Outstanding portraits of Marcello. Love your use of 1/12. Perfect!